Universal Music Group agreed to settle a lawsuit brought by the Detroit producers who helped start rapper Eminem's career over royalties from Apple Inc.'s iTunes and mobile-phone ringtones. Lawyers for the Vivendi SA unit and the producers filed a request to dismiss the case in federal court in Los Angeles on Oct. 29, saying, "This action has been resolved to the satisfaction of all parties." Terms of the settlement weren't disclosed. 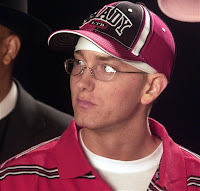 In 2009, a jury rejected arguments by FBT Productions LLC that Eminem is entitled to half the net receipts the record company gets for the downloads, rather than his standard royalties from record sales. The producers, who first signed Eminem in 1995, get 40 percent of the royalties. A federal appeals court in 2010 reversed the verdict, saying the trial judge had incorrectly denied a request by the producers for a pretrial ruling that the "masters license" agreement for the recordings clearly applied to downloads and not the records-sold provision. Peter Lofrumento, a spokesman for Universal Music, and Richard Busch, a lawyer for the producers, confirmed the settlement without providing additional comment. Eminem, whose real name is Marshall B. Mathers III, wasn't a party in the case. FBT Productions, owned by brothers Jeff and Mark Bass, signed Eminem to an exclusive recording deal in 1995. In 1998, they made a deal with rapper Dr. Dre's Aftermath Records, a unit of Universal Music, which released Eminem's breakthrough album, "The Slim Shady LP."